What do you get when you combine a fishing tournament with a banquet dinner / silent auction on the beautiful Lake Conroe? 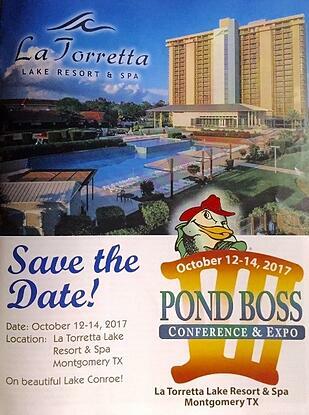 You get the 7th annual Pond Boss Conference and Expo at La Torretta Lake Resort and Spa in Montgomery, Texas! Spend the weekend at a peaceful retreat where you can learn about pond management and visit with a couple hundred like-minded folks at the same time. Even meet with “Pond Boss” magazine editor and publisher, Bob Lusk! Activities include an annual fishing tournament, trade show, Saturday’s banquet and silent auction, and informational lectures dispersed throughout the weekend. If you’ve been looking for the best pond and lake products, the trade show is what you’ve been waiting for! There are even activities for spouses to enjoy together. There truly is something for everyone at the Pond Boss Conference & Expo! When to plan for the fishing event of the year? The weekend of October 12 through October 14. Mark your calendars! For those of you coming from out of town, travel and lodging costs include an option for a discounted hotel rate of $149 per night. That is on top of the individual registration fee of $350 if paid by September 1st, prices will rise to $400 after this date. There are also discounts available for couples, seniors and students.